Alexandre Rockwell, Little Feet, 2013, black-and-white, sound, 60 minutes. FAST BECOMING the season’s indispensable film event, the “First Look” series at the Museum of the Moving Image once again presents an array of unusual cinematic pleasures. This year’s lineup, from ten different countries, demonstrates that filmmakers continue to tease the boundaries between fiction and documentary. How else to consider Juan Barreros’s The Inner Jungle (Spain, 2013), which mischievously weaves Darwin’s report of an encounter between a child and a mosquito in 1830, a discovery involving a self-pollinating orchid, an old woman who recalls Spain’s Fascist era, and the personal fates of the filmmaker and Gala, the woman (wife?) he lives with who becomes pregnant against his will? 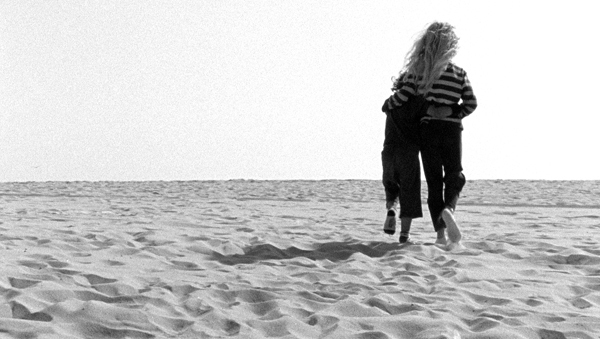 And is Alexandre Rockwell’s Little Feet (2013), the opening film, simply a fable about two delightful children fending for themselves and adjusting to the apparent death of their mother? Or, since the children, Lana and Nico, are Rockwell’s daughter and son, and he dedicates the work to his wife—and their very much alive mother—isn’t there a bit of macabre cross-breeding of genres here? Among the certified documentaries, at least three stand out: Caroline Martel’s Wavemakers (Canada, 2012), Richard Misek’s Rohmer in Paris (UK, 2013), and David Cairns and Paul Duane’s Natan (Ireland, 2013). Martel’s is an intriguing chronicle of the martenot, a musical instrument inspired by its inventor’s fascination with the “radio electric interferences” he heard in transmissions during World War I. Named after Maurice Martinot, this instrument, unlike the theremin and similar devices, is still in use. It not only served to create sound effects in prestigious movies by, among others, Abel Gance and Marcel L’Herbier, but was embraced by swing and pop bands from the 1930s on, and was prominently used in such rarefied compositions as Olivier Messiaen’s opera St. Francis of Assisi (1983) and Marie Bernard’s 8 Haikus (2011). Martinot says his invention was designed to help musicians “control the parameters of musical sound…by becoming an extension of the interpreter’s nervous system.” Plenty of experts, as well as Martinot’s son, are on hand to flesh out this corner of musical history with engaging instruction. No true cinephile should miss the delightful Rohmer in Paris, which, short of prompting an immediate flight to Paris, should urge viewers to rewatch every movie Éric Rohmer made in that city. While the work is an undisguised love letter to the filmmaker, it is also a deft piece of film scholarship. Compiling shots of numerous locations across Rohmer’s works, Misek scrutinizes the telling glances and “chance” encounters among his appealing flaneurs, whose moves generate a network of amorous entanglements that constitute Rohmer’s view, not only of his favorite city, but of life itself. Noting the filmmaker’s beginnings in the Nouvelle Vague when he brushed shoulders with Godard and Truffaut, Misek illustrates how Rohmer converted the geography of the world’s most romantic city—its boulevards, gardens, plazas, and subways, its cafes, hotels, and monuments—into a style unmistakably his own. Misek wonders if Rohmer was not, in fact, making the same film all along, an endless loop documenting the daily gestures and routines of the Parisians of the era. With the help of a bountiful collection of clips from the films, placed with the precision of an astute film historian, Misek has created a work of intelligence and passion worthy of his subject. Natan is also about a filmmaker who worked in France, but this tale is far from joyous. Bernard Natan arrived in Paris in 1905 from Romania, where he was born Natan Tannenzaft in 1886. Almost immediately he became involved in the movie business, working as a chemist for Pathé, then a projectionist. After serving in World War I, he became a French citizen, then produced newsreels and many of Pathé’s biggest films, including La Merveilleuse vie de Jeanne d’Arc (1929), Les Miserables (1934), and Gaietes de l’Escadron (1932). Amid the anti-Semitic atmosphere in France in the ’30s, he was accused of hiding his Jewish identity, found guilty of trumped-up charges of swindling Pathé, denaturalized, and sent to Auschwitz in 1942, where he died a year later. Interest in Natan was revived when it was alleged that he made and played in pornographic films in the early 1900s. Although we see footage from films that could support the case, several individuals, including Natan’s granddaughters, deny the allegations. This is a piece of early cinema history well worth any serious filmgoer’s attention. Ahmad Abdalla, Rags and Tatters, 2013, color, sound, 87 minutes. Even some of the narrative features in the series have a documentary air. Both Aran Hughes and Christina Koutsospyros’s To the Wolf (2013) and Ahmad Abdalla’s Rags and Tatters (2013) treat contemporary circumstances in their countries of origin (Greece and Egypt, respectively) in muted, nontheatrical tones. The former begins with a man bemoaning the disastrous state of economic and political affairs in Greece, where average people face hunger and poverty with no sign of relief. Virtually plotless, the film moves through a series of tableaux as impoverished looking as the dismal lives they etch. 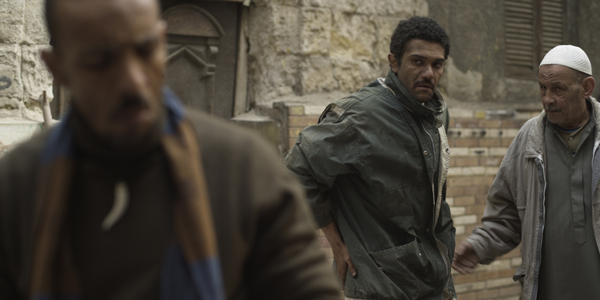 Rags and Tatters, though set amid the same events in Cairo as the recent documentary The Square, could not be more different. While The Square immerses us in the immediacy of current events—its rhetoric and politics a bit too neatly drawn—Abdalla’s story unfolds quietly, nearly bereft of dialogue, with a denouement both inevitable and surprising. Rather than tackle the larger questions that consume the vocal demonstrators of The Square, Rags and Tatters, as its title suggests, deals with the mundane lives of ordinary people, disengaged from the momentous uprising occurring nearby, despite TV coverage and pleas on public address systems. The thin narrative thread follows a young, apolitical Muslim searching for the family of a wounded man he encounters in the beginning, carrying the latter’s cell phone where he had recorded the violence in the city square. The unnamed protagonist runs to assist the man’s family when he learns they are being attacked by anti-Christian thugs, and dies in the chaos as the cell phone records yet another “minor” casualty gone ignored. In two narrative features from Chile, unsettling circumstances unfold amid magnificently photographed settings. Marcela Said’s The Summer of Flying Fish (2013) is a coming-of-age tale about a young, idealistic daughter of a plantation owner who becomes distraught over her father’s treatment of the locals. More offbeat but far grimmer is Sebastián Sepúlveda’s The Quispe Girls (2013), based on actual events that occurred in Chile in 1974. Set in an austere, punishing mountain terrain far from any city, the three women of the title follow a rough, daily regimen herding sheep and goats, hoping to sell their cheese, spending long days in the cold outdoors and living in a sparsely furnished, fire-lit cave. Though dialogue is minimal, they speak of vague fears that “everyone is leaving the area because something bad is going on.” An occasional visitor confirms a police-state atmosphere and widespread arrests in the city, and the women learn that a new “erosion” law threatens their livelihood since it requires killing goats to reduce grazing. Hopeless about the future, the women resort to an extreme solution, as bluntly and unsentimentally presented as the rest of this bleak, unforgettable image of primal existence. “First Look” runs January 10–19 at the Museum of the Moving Image in Astoria, New York.